Second Boom Set to Deploy - Solar System Planets And Moons Section. Second Boom Set to Deploy. Mars Express and its 20-metre radar booms. Image credit: ESA. The European Space Agency is moving forward to deploy the second of Mars' Express radar booms. The 20-metre (65 foot) boom is set to unfurl between June 13 and June 21. The deployment was delayed because of a problem with the first boom, which didn't unfold perfectly, so engineers had to devise a solution to warm it in the Sun to get it to fully lock into place. Once its three booms are extended, Mars Express will be able to search for underground sources of water and ice on the Red Planet. The Mars Express spacecraft control team at ESA’s spacecraft Operations Centre (ESOC) succeeded in unblocking the hinge by exposing the cold side of the boom to the Sun. This warmed the hinges and the boom quickly became unstuck. In the end, the first boom deployment was completed on 10 May. 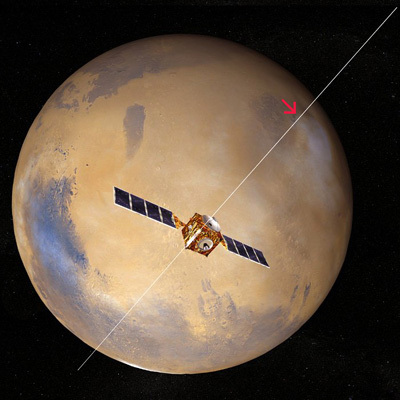 After this event MARSIS, the Mars Express Sub-Surface Radar Altimeter, will enter into a commissioning phase for the next few weeks, before starting to look at Mars’s ionosphere during martian daylight, and to probe down below the Martian surface during the martian night.